Read-only – if this box is checked, the document will no longer be editable, even in Edit Mode. This is the default setting for PDFs and Image files. 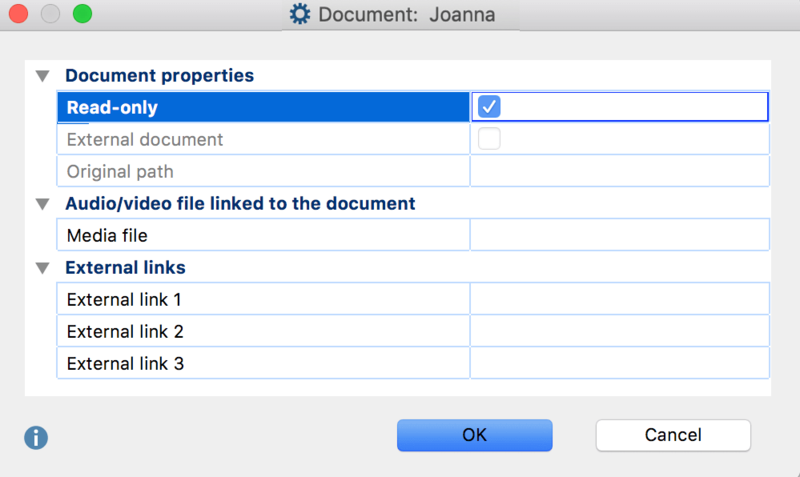 External Document – If this box is checked, it means that the document is not actually part of the MAXQDA project file. Instead it has been copied into the folder for externally-linked files. In this case, the file name is also indicated under Original Path. To import an externally stored document into the MAXQDA project file, click on the Embed external document button. External link 1/2/3 – To create a link to a file that is accessible from your computer and contains, for example, additional information about the interviewee or image, click in the line for the external links and then click the three points at the end of the line.